KYU BELT TEST RESULTS. 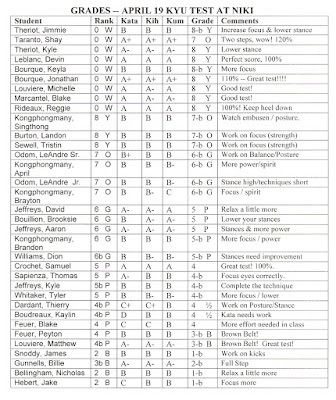 Please see the image below for the results of the Kyu belt exam. I thought that everyone did very well. Some of you will be very pleased with the results and some of you may be a little disappointed, but greater effort in your training at the dojo will yield better results on the test. In other words, it is up to you to make the grades better by harder and more concentrated training during your everyday class. If you are having trouble making out the image I am e mailing a pdf of the document to our mailing list and I am posting the results on the door of the dojo as usual for Sunday. Don’t get a big head if you did very well and don’t get too upset if you didn’t do as well as you would have liked, moderation and the ability to endeavor is the key to success in Karate. Thanks for all the hard work and the efforts you put into the class and lets all work even harder for the improvement of our dojo and ourselves. ALL SOUTH 2008. Special congratulations to all the participants of the 2008 Tournament from NIKI. We had 11 competitors and 3 ring officials and judges. Participants were Aaron Jeffreys, Jake Hebert, Kyle Jeffreys (3rd Kumite), Nicholas Bellingham (3rd Kumite), Reed Bellingham (3rd Kata), Candis Durand (3rd Kumite), Brandon Kongphongmany (2nd Kumite), David Jeffreys (2nd Kumite), Thomas Dean (2nd Kata, 2nd Kumite), Chase Norris (1st Kumite) and Cody Sedlitsky (2nd Kata, 1st Kumite). Officiating were Steve Bellingham, Candis Durand, Chad Norris and Sensei Scott Decuir. Here is a photograph of the team just before the tournament began. I was very proud of all the participants because, whether they won or not, they competed with great dignity, character and poise. They all exhibited a strict adherence to the proper rules of conduct and they all participated with good sportsmanship. I was always taught that it doesn't matter if you win or lose, only how you play the game. 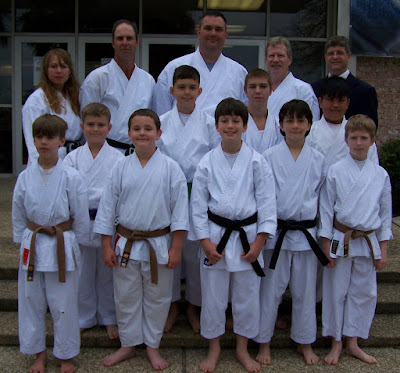 Well, our team played the game with great class which reflected well upon their Sensei. Thanks to all. Osu, Sensei Scott. APRIL STUDENT OF THE MONTH -- Haley Hebert. The April 2008 Student of the month is a black belt at NIKI and was a runner up for student of the year 2007. She is a very hard working student, both at the dojo and in her studies. She is currently working on her college applications and getting ready for her Senior Year in high school. Congratulations to Haley on all your karate and academic success. KYU TEST -- Our Kyu test will be Saturday, April 19, 2008. There will be more information in the newsletter regarding the dates, the pre tests, the costs and the clinic. 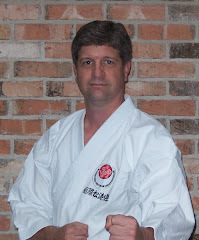 If you need any more information, please contact Sensei Scott. GASSHUKU 2008 -- Was a big success and we had a great time Saturday, but Sunday was rather rainy. Please take a look at the collage at the dojo for more visual images of the event.